We can probably all agree that a hearty plate of spaghetti and meatballs, a quick slice of pizza, or a plate of chicken Parmigiana at a neighborhood spot can be great -- but sometimes, simple won’t do. 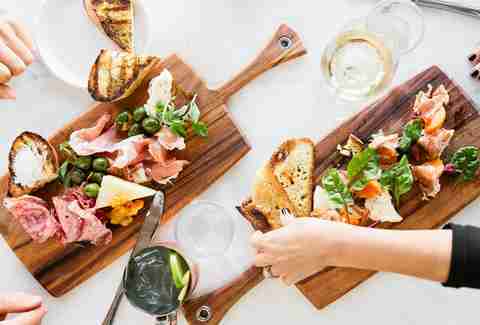 Thankfully, among its many fantastic restaurants, Los Angeles has amassed a wealth of regional and high-end Italian spots that actually make pastas and cure meats in-house, and deliver a higher class of hospitality. Here are the very best Italian joints in town. OK, so Eataly’s first West Coast outpost isn’t technically a restaurant -- but this massive, 67,000-square-foot space devoted to Italian cuisine still deserves a spot on our list. Located inside Westfield Century City, the three-story emporium boasts several restaurants, cafes serving up Italian espresso and unique-to-LA sweet and savory yogurt parfaits, take-away counters (one that specializes in cannoli and stuffed bombolonis, another that hawks paninis -- you get the idea), and a marketplace selling hundreds of Italian products ranging from pasta to olive oil, wine, cured meats, and cheeses. If you’re hankering for a nice, sit-down meal, go to La Pizza & La Pasta -- two of Italy’s most delicious imports made right before your eyes. A newcomer to the Westside, upscale Luigi al Teatro offers a marine-leaning menu boasting Italian flavors and ingredients. Black ravioli is topped with a truly succulent-looking lobster tail, the saucy bigoli is presented with a massive split-open prawn, and linguine comes with sea urchin and shallots. Oysters, caviar, and other delicacies have a place on the menu -- as do a selection of wines hailing from Puglia, chef Luigi Fineo’s hometown. Tasteful, coastal Italian cuisine isn’t quite what you’d expect at a mall -- but then again, mall food isn’t what it used to be. In Cal Mare’s case, that’s a good thing. Created by chef Adam Sobel in collaboration with Michael Mina, this dazzling space takes up residence in the Beverly Center. The restaurant’s Positano-inspired decor -- pink bougainvillea dripping from an overhead trellis, ocean-blue tiles, an outdoor fireplace -- is only surpassed by its menu, which includes cool riffs on Italian fare, like a spicy shrimp & chickpea pancake served with saffron aioli and a flavor-charged pumpkin agnolotti with crab, sea urchin, and truffle. Chef Casey Lane -- whom you may know from Venice’s beloved Tasting Kitchen -- recently opened this modern trattoria inside the boutique Kimpton La Peer Hotel. The glamorous space is designed to impress, so bring your clients, dates, and mothers-in-law to enjoy its Italian dishes with Southern French and North African influences. The wood-fired seafood, including a melt-in-your-mouth branzino, is downright delectable, and so’s the black cod pasta and traditional chickpea crepe served with falafel, crudo, and marinated local veggies. Everything -- even the bread and pastries -- is made in-house and by hand in the massive open kitchen. Once you’re done with dinner, move over to the open-until-2am courtyard bar and finish things off with an excellent mezcal cocktail. 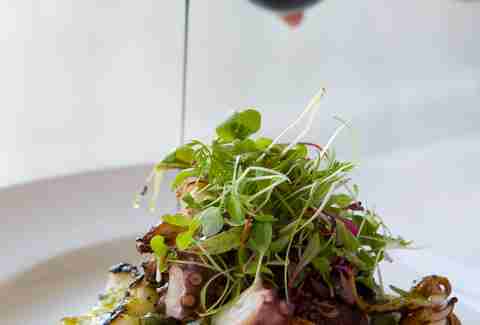 Since opening this cozy, understated Pasadena restaurant four years ago, chef Bruce Kalman has only improved on its seasonal menu, making Union one of Old Town’s most sought-after reservations. If you’re there early enough, snag the porchetta, which often sells out -- it’s the star of the show, a beautifully prepared piece of meat with crisped skin and a buttery, fatty interior. If you miss out, lardo-topped meatballs, potato leek agnolotti with walnut pesto, and even the bread accompanied by cultured butter and giardiniere (these addictive pickles are Kalman’s specialty) will keep your belly satisfied. Don’t skip out on dessert either: there’s an ultra-moist olive oil cake with honeycomb gelato and a velvety dark chocolate budino that you can’t leave without trying. This all-day restaurant is brought to you by the group behind Pitfire Pizza, but its vibe (think: industrial, modern, and filled with natural light) and menu offerings could not be more different. The place slings plenty of Italian-skewing brunch and dinner options, starting with buckwheat ricotta pancakes and basted eggs during the day, standout arancini at night, and eggplant Parm and pizzas served around the clock. Pro tip: Take an Uber here because the stiff, artisanal drinks -- like a dinnertime chestnut toddy and a brunchtime punch made with rum, Campari, roasted pineapple, lime, and cinnamon -- are well worth it. 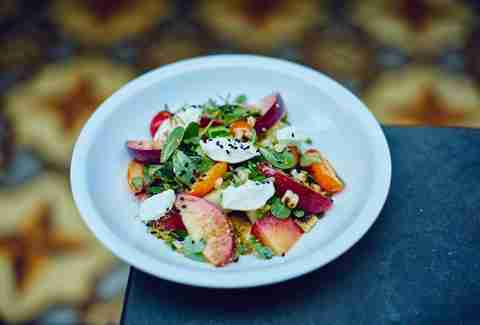 This modern Italian restaurant from chefs Ori Menashe (savory) and Genevieve Gergis (sweet) was a game-changer for downtown LA’s Arts District. Meat hooks in the dining room might come across as macabre elsewhere, but here that accent just hints at the intentions. Salumi is made in-house, roasted bone marrow’s spooned over spinach gnocchetti, and a whole roasted lamb’s neck comes covered with salsa verde. Most everything is handcrafted, including the bread, pastas, wood-fired pizzas, and dessert; there are usually at least seven or eight sweets in play, most of them seasonal, typically including cakes, tarts, and fritters. The City of Los Angeles refilled the Silver Lake Reservoir last year, and the neighborhood’s popping with tons of new restaurants, but some things -- like beloved Alimento -- haven’t changed (for good reason). Zach Pollack, Sotto’s co-founder, traded his previous post’s Southern Italian focus for the top half of the boot, but that doesn’t mean Pollack is bound by tradition. Far from it at this glass-fronted restaurant, where soup-stuffed tortellini en brodo resemble xiao long bao, and chicken Milanese forms the backbone of one of LA’s best fried chicken sandwiches. Gino Angelini has been a champion for his country’s cuisine since emigrating to LA from Italy’s Emilia-Romagna region in 1995. He cooked at some of the city’s best Italian restaurants before opening Angelini Osteria, where he’s mentored many chefs, including Bestia co-founder Ori Menashe. He opened other restaurants, but only his namesake Mid-City restaurant (and its offshoot marketplace Angelini Alimentari, which hawks gelato, sandwiches, and salads) perseveres. 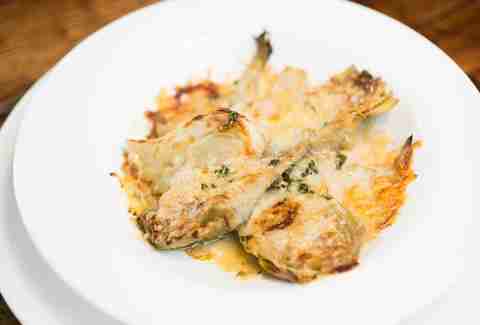 Regulars who frequent Angelini Osteria enjoy consistent quality and a sprawling menu that includes a parade of house-made pasta dishes, including his famed lasagna verde, and hearty secondi like veal chop Milanese or Dover sole finished in the wood oven. Nancy Silverton, Mario Batali, and Joe Bastianich transformed a kitchen classroom into a salumi bar, and ultimately, LA’s most over-the-top monuments to meat, adding even more value to a compound that also includes Pizzeria Mozza and Osteria Mozza. 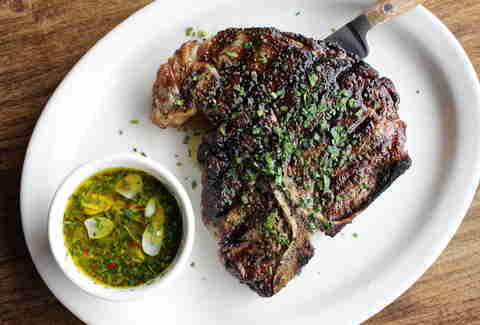 SoCal native Ryan DeNicola now helms the open kitchen, which includes a wood grill that yields massive cuts like bistecca Fiorentina and a fennel pollen dusted tomahawk pork chop that are consistent with the restaurant’s cleaver logo. Charcuterie is made in house using exacting standards, with salumi, pate and terrine, and rarely seen culatello all making appearances. The crispy flatbread -- focaccia di Recco -- contains no meat, but it does ooze Stracchino cheese. 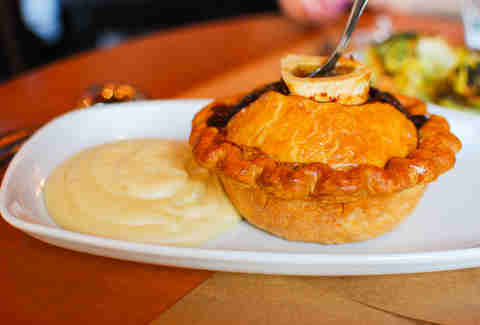 Mozza Group pastry chef Dahlia Narvaez, a James Beard Award winner, furnishes desserts, though it’s tempting to just order the beef cheek and bone marrow pie. 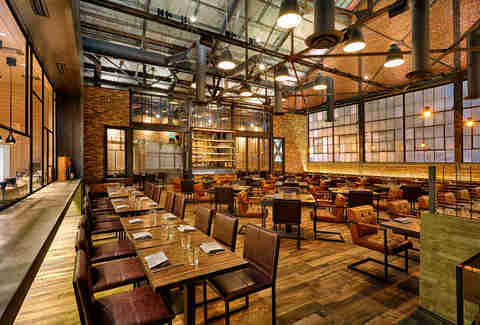 Chef Angelo Auriana, front-of-house partner Matteo Ferdinandi, and beverage director Francine Diamond-Ferdinandi turned an Arts District back alley into an industrial chic dining destination in 2013. Since then, this tucked-away Italian restaurant has become a popular choice for pastas like handkerchief pasta tossed with Ligurian almond basil pesto. 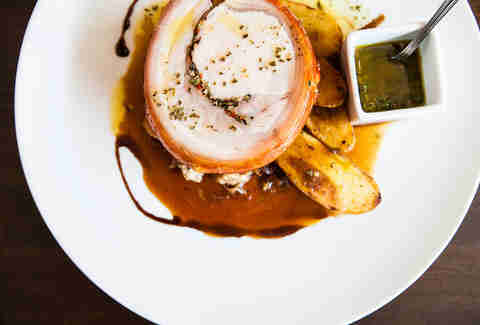 Dinner brings out big guns “from the sea and land” like juicy porchetta or monkfish fillet. The Factory Kitchen also makes its own focaccina di Recco, which is filled with Crescenza cheese and available topped with combos like San Marzano tomatoes, capers, and anchovies or zucchini blossoms and parsley. Chef Vic Casanova left the hotel restaurant world to open Gusto with wife Jessa in 2011. Last summer, they closed down sister spot Pistola to move Gusto into a larger space -- deserving of its big flavors and a well-deserved reputation for serving premium house-made pastas. 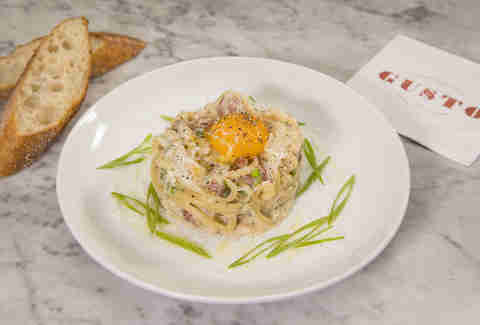 Bucatini carbonara is a particular standout, with chewy tubes sticky with pancetta and washed with egg yolk, as well as a tasty linguine with crab, zucchini pickled Fresno chilies, and sea urchin sauce. And though Pistola was better known for its meat dishes, don’t sleep on Gusto’s meatballs, topped with zesty tomato sugo on a whipped ricotta bed. 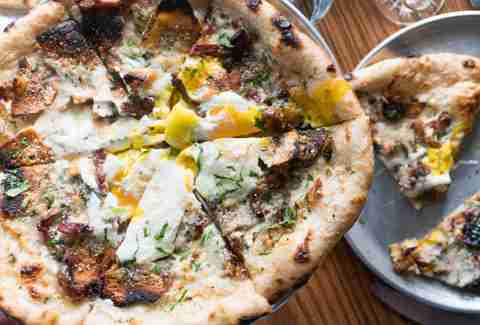 Jon Shook and Vinny Dotolo transformed a dingy Fairfax Village pizzeria into a ray of edible sunshine. 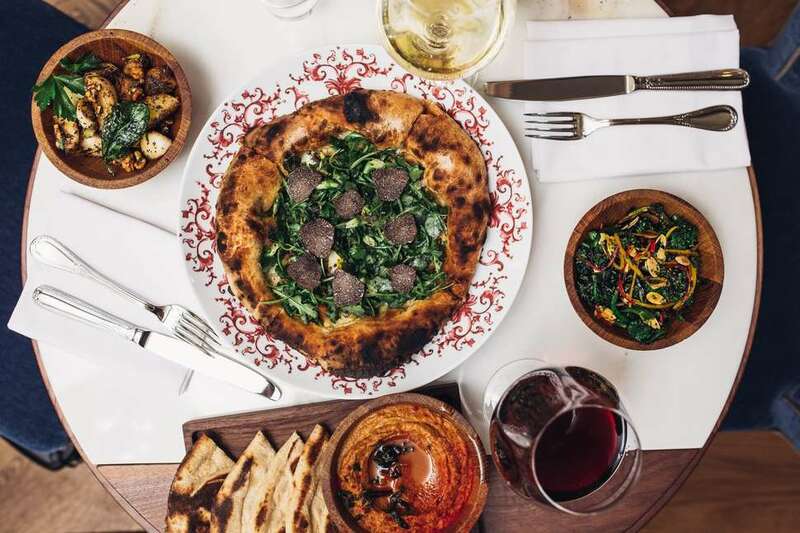 The family-friendly Italian-American restaurant has pretty much everything an adult (or kid) could want, including pizza with crave-worthy crust, house-made pasta dishes, and chocolate budino and Straus soft serve ice cream for dessert. 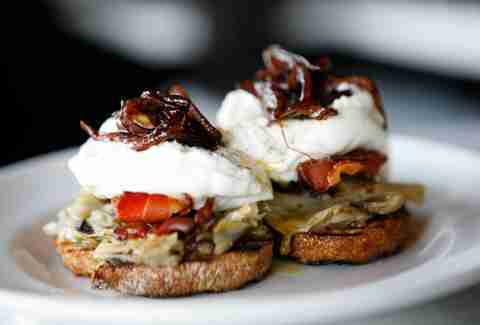 If you wake up early -- a big if -- you’ll also find the restaurant makes a killer breakfast pizza and BLT. The duo’s front of house partner/beverage director Helen Johannesen also presides over Helen’s wine shop in back of the restaurant, with a small but vital selection -- and home delivery. Executive chef Angelo Auriana and front-of-house partner Matteo Ferdinandi built on the success of The Factory Kitchen by opening this nearby trattoria with a glass-fronted kitchen. 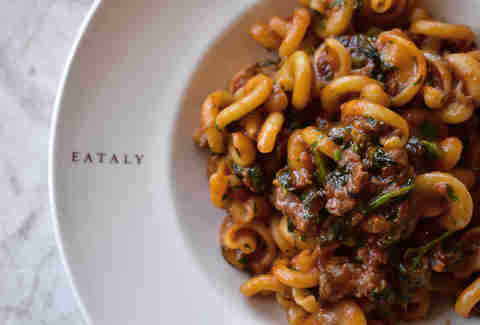 Seasonal pastas and salads get prominent placement on the menu, as do big cuts of meat. 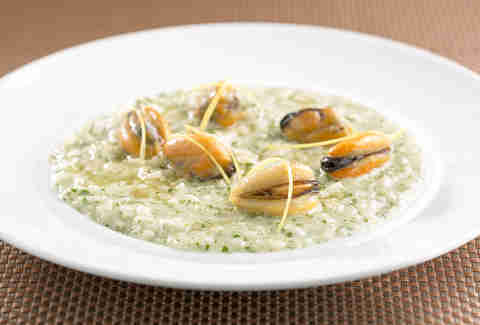 Risotto also gets the rare spotlight: chewy carnaroli rice hosts proteins like milk-braised salt cod and bone marrow. Pro tip: Officine Brera also has an off-menu dish at dinner, a delicious chickpea pancake called farinata. Osteria La Buca, located down Melrose from Paramount Studios, has been a neighborhood favorite for over a decade, which has allowed the restaurant to grow and improve its design. Owners Stephen Sakulsky and John Moezzi made a big score when they hired chef Cameron Slaugh, who previously worked at Manhattan culinary temple Eleven Madison Park. Slaugh takes an inspired approach at Osteria La Buca (which is now well worth a drive), with house-made pastas, pizzas and salads starring seasonal ingredients, and some precisely prepared proteins like fish and a top-flight pork chop. Nancy Silverton, Joe Bastianich, and Mario Batali created the Italian Army knife of restaurants with their Osteria, which combines a high-end Italian restaurant with a lively amaro bar and a mozzarella bar where Silverton herself can also be found preparing dishes with mozzarella and burrata. Dahlia Narvaez makes sure seasonal desserts keep pace. The only thing this mozza doesn’t have is pizza, but neighboring Pizzeria Mozza more than covers that territory. Steve Samson and Zach Pollack devoted this subterranean Beverlywood restaurant to soulful Southern Italian cooking -- and even though Pollack is now focused on Alimento, Samson and chef de cuisine Craig Towe ensure that Sotto is still going strong. Stefano Ferrara installed a yellow-tiled, wood-burning oven patterned after the best versions in Naples, which burns oak to produce the city’s best pizza. 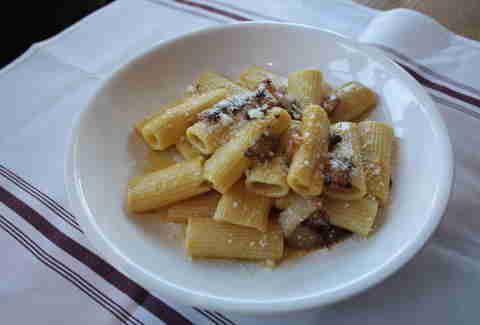 Guanciale pizza with fennel pollen is a particular standout, as are the house-made pastas, like chewy rigatoni with chicken liver ragu. Grilled pork meatballs and a blistered little gem salad with anchovy dressing are similarly memorable. Brentwood’s San Vicente Blvd has become a hotbed for Italian restaurants, but the refurbished restaurant that Maureen Vincenti and Chef Nicola Mastronardi have steered since 1997 still stands out in the crowded field thanks to the level of their food. In summer, they serve a great soft-shell crab with roasted vegetables, and house-made tagliolini with Manila clams and zucchini. Cooler weather calls for richer meat dishes like porchetta. 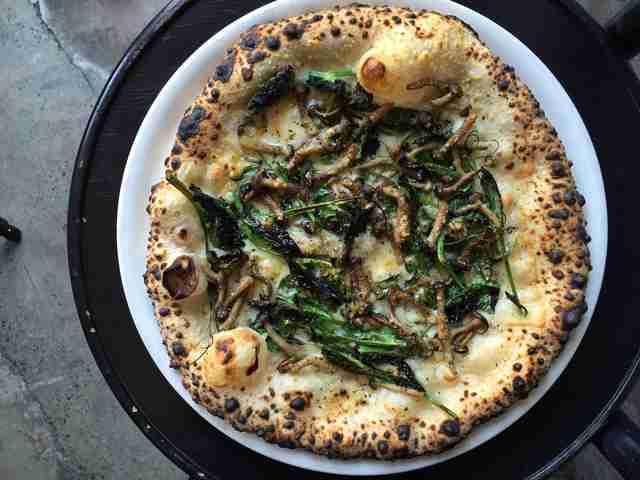 No matter the season, Vincenti also always hosts Monday’s popular pizza night. If you’re lucky enough to snag a reservation at Evan Funke’s Felix one of Thrillist’s best restaurants of 2017 -- consider fasting before you go. The restaurant, which pays homage to Italy’s most beloved culinary regions, boasts a glass-enclosed, temperature-controlled pasta lab where you can watch Funke himself (who sat down with Thrillist to talk about this very subject) roll and hand-cut twisty trofie and delicately shaped orecchiette. 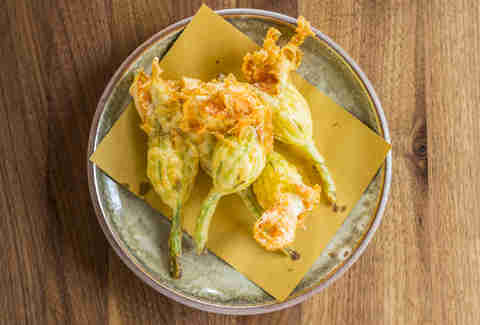 Though pasta’s his specialty (you may remember Funke from Culver City’s now-closed Bucato), the starters (like stuffed squash blossoms or juicy pork meatballs) and pizzas are no afterthought. The kitchen proudly mixes its dough by hand, which results in thin, slightly charred crusts topped with seasonal ingredients. 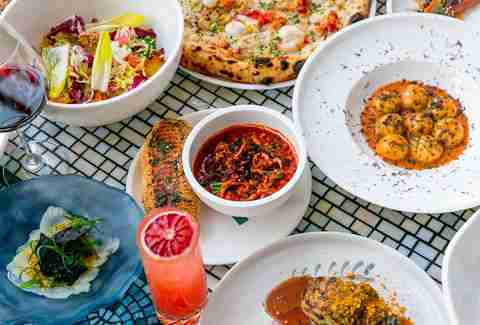 Top Chef contestant Antonia Lofaso’s food reflects her Italian-American heritage, making Scopa one of the Westside’s best spots for shareable small plates with an old-school Italian slant. The hot starter offerings are all rich and excellent -- crisp, lemony calamari blackened by squid ink; a fried rice ball stuffed with meat (and yes, you’ll want it with an egg); squash blossoms oozing fresh ricotta; and scallops, large, plump, and sitting in brown butter. 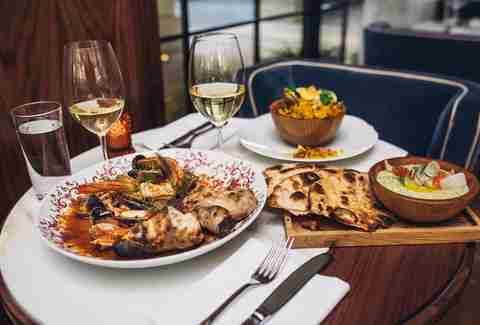 The salads, pastas, and mains (like whole branzino and veal chop Milanese) are equally memorable, but you’d be forgiven if you have a hard time getting past the antipasti menu. And since mixologist maestro Pablo Moix has curated a selection of exclusive spirits over the past year, don’t leave without sipping on one of Scopa’s small-batch bourbons. 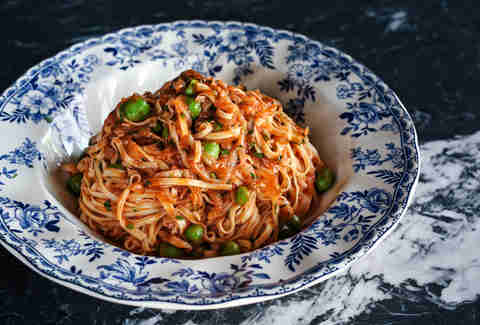 You can thank chef Steve Samson’s mother and grandmother for Rossoblu’s Bolognese-inspired menu. There’s “Mom’s Minestra Nel Sacco”: Parmesan dumplings wrapped in cloth and released into a fragrant broth once the dish arrives at your table. Then there’s “Nonna’s Tagliatelle Al Ragu’”: pasta made in-house (of course) and mixed with just the right amount of meaty sauce. Even the kitchen, which contains a wood-burning hearth powered by oak coals, is a tribute to Samson’s grandfather. Like so many other Downtown spaces converted into restaurants, Rossoblu preserves its building’s industrial feel -- all high ceilings and soaring concrete columns -- but couch-like banquettes and other antique-inspired touches lend a warm familiarity. Which works perfectly, because after all, you’re there to enjoy nonna’s home cooking. This charming Downtown trattoria serves up saucy, stick-to-your-bones Italian comfort food, which, at the end of the day, is really the best kind. 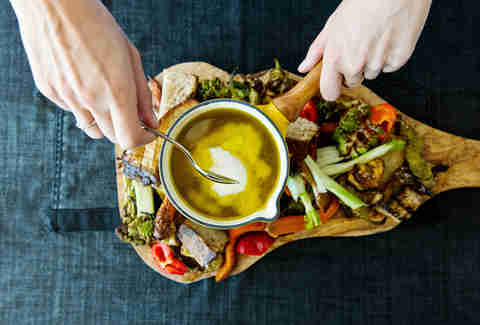 Start off with pan-fried shrimp cakes and thin-sliced baked eggplant rolls, load up on pumpkin ravioli swimming in cream sauce or trippa dello chef (a tender tripe pasta that’s hard to find elsewhere), and end strong on classic Italian sweets -- perhaps a bite of homemade biscotti or the cold-pressed olive cake. You’ll leave happy, and so will your wallet, since the dinner bill at Maccheroni almost never strains your budget. Hailing from Sicily, chef Celestino Drago helped to pioneer the Italian dining renaissance in Los Angeles, ranging from established ventures like Beverly Hills’ Il Pastaio to Drago Ristorante, which opened late last year in the Petersen Automotive Museum. But Drago Centro -- his downtown magnum opus housed in a former bank vault -- remains a stalwart and continues to turn out inventive riffs on Italian classics. Feel free to order the menu mainstays, such as a jumbo-sized piece of handkerchief pasta served with crab and pesto, or a tender, truffle-crusted chicken that your knife will glide right through. On any given day, you’ll find chef Claudio Marchesan chatting up guests and asking how they’re enjoying his restaurant’s rustic Italian offerings. The intimate space consistently attracts loyal Montana Avenue locals, and Marchesan himself is equally invested in the community. (In fact, he often mines Santa Monica’s farmers market in search of fresh produce for dinner service.) His finds -- such as juicy grape tomatoes or baby lettuce -- might show up as part of the creamy burrata starter or the delightfully crisp mixed salad. As for heartier finds, there’s his flavor-packed veal and pork meatballs, the delicious combo of tripe and beans, and veal loin medallions. The namesake dish at this long-standing neighborhood joint is a hearty plate of mixed, fried things (quite literally, that’s what fritto misto means in Italian) -- and it’s exactly how you should kick-start your meal. Piled with battered and fried shrimp, calamari, and veggies, the platter comes with a dangerously addictive roasted garlic mayo dip that will have you begging for a refill. And while other restaurants pride themselves on Instagram-ready fare and photogenic interiors, Fritto Misto is as cozy, homey, and unpretentious as they come. That’s what you’d expect from a place that plies you with plenty of warm, fresh bread and butter and has a build-your-own-pasta option on the menu. Two words: cheese wheel. This perpetually lively Montana Avenue eatery serves some of its pastas dalla forma -- a preparation method where the noodles are tossed into gigantic cheese wheels and arrive to you steaming, fragrant, and irresistibly cheesy. (Warning: The practice isn’t executed tableside, so if you want a peek, sneak over to the dining room’s back corner for a look-see.) For a simple, straightforward dish that truly showcases the perfection of Forma’s al dente noodles and the flavors of the cheese, ask for the chitarra cacio e pepe -- a combo of black pepper, extra-virgin olive oil, and slightly sharp, salty, melty Pecorino Romano. Don’t overlook the cheese bar either -- there’s an overwhelming array of options, from pungent goat Cheddar to Boschetto al Tartufo (a truffle-flecked, semi-soft cheese made from cow’s and sheep’s milk). Santa Monica’s not exactly hurting for good Italian cuisine, but this fine-casual, reasonably priced pasta bar definitely fills a void. The brainchild of Sugarfish co-founders Lele Massimini and Jerry Greenberg, Uovo is entirely focused on pasta (with a few veggie complements). 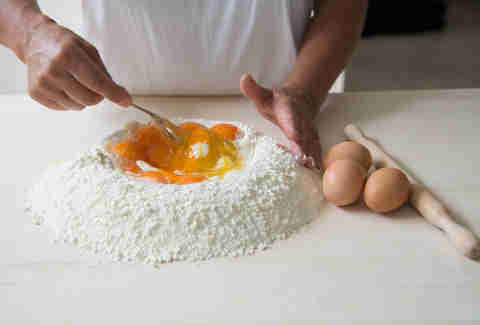 The noodles are hand-made in a kitchen in Bologna using special red egg yolks available only in Italy, and then shipped stateside daily so that Uovo’s cooks can prepare classic dishes -- cacio e pepe, a slightly spicy tonnarelli all’Arrabiata with a kick, and tagliatelle al ragu (made without cheese, milk, or cream, it’s already a signature dish) -- that serve to highlight the delectable pasta. Restaurateur Sam Fox, who’s behind Third Street Promenade-adjacent spots like True Food Kitchen and Flower Child, opened a North Italia outpost in Santa Monica last year. And although it’d be easy to dismiss a chain restaurant with locations in Arizona and Texas, this place is a solid bet when you want to enjoy hand-made pizzas (go for the meaty Pig pie piled with spicy pepperoni, soppressata, and sausage) and pasta on an airy patio in the middle of tourist town. The calamari is crisp and served with lemon vinaigrette, the garlic bread chunks come doused in white truffle and topped with house-made ricotta, and the Bolognese spaghetti is dusted with a generous portion of Grana Padano cheese. Plus, it doesn’t hurt that you can walk off your meal at the SM Pier just steps away.